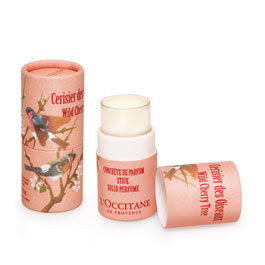 To all Loccitane Cherry Blossom fans! 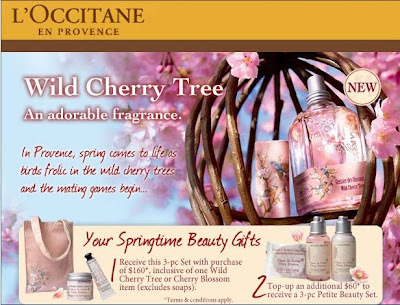 you'll be delighted to know that next month March, 2010 Loccitane will be introducing their latest Wild Cherry Tree range in conjunction with Cherry Blossom promotions. I inquired at Loccitane MidValley on Sunday and got to see the upcoming collection and promotions. I am excited!!! muahhaa. The SA showed me the Wild Cherry Tree solid perfume stick (second item in the pic above that looks like a balm) it's RM69 I think. the size of your thumb. The scent is sweet and yummy like berries n cherries. Can't wait to see the collection in March~! In Provence, Spring awakens with birds' loving games, when they happily play in wild cherry trees."" --Olivier Baussan. With its white flowers and noble wood, the wild cherry tree is one of the most ancient and precious varieties of its kind. The wild cherry tree is also a favorite amongst small birds, that love its shiny fruits filled with sweet elixir. So much so that they leave a trail of cherry seeds in their wake throughout the forest, as a promise of renewed delicacy in the year to come. A tender, mouth-watering touch of Provence. 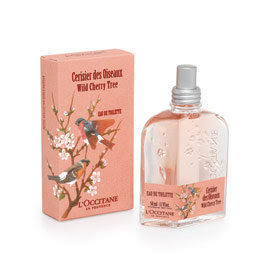 This woody, fruity Eau de Toilette offers a new fragrant interpretation of the cherry tree. The scent of wild cherry blossom mingles with sparkling notes of bittersweet berries, before settling into a soft woody base. Contains wild cherry tree extract from Provence. A solid perfume for your travels, like strolling through the cherry orchards. An irresistible fragrance to slip into your handbag! This alcohol-free solid perfume blends the flowery and fruity scent of wild cherry trees. Perfect for fragrant touch-ups throughout the day! Contains wild cherry tree extract from Provence. The softness of a spring breeze full of flowers and the juicy flavor of a ripe cherry. The Wild Cherry Candle subtly diffuses its scent with a blend of wild flowers and tangy berries for a warm and happy atmosphere at home. 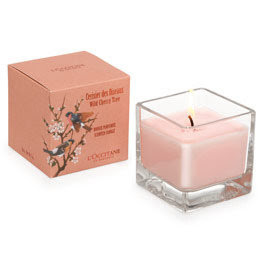 Nestled in an elegant glass holder, this perfumed Candle provides a perfect glow. More than 30 hours of burning. yummm! i love cherry blossom. Win a popular Shu Uemura DeepSea Facial Mist! Are you coming to the Laneige Spring Workshop? Robinsons Customer Service is the WORST! Free Origins Get Green GIVE! I got my free Laneige Water Sleeping Pack EX! Free Laneige Tutorial & Trial Kit!